One problem with building a world out of soft materials like papyrus is that very little would be left today. No permanent housing structures have survived from pre-Pharonic times, though traces of housing exist. One view of a house in the Water World is shown in a famous mosaic in Palestrina, Italy, that dates from 100 BC. It looks very much like the houses the Arabs build even today in the marshes of Iraq. Reed structures have also been reconstructed from old clay seals and temple drawings. Another source of information are the contemporary swamp huts built by Africans in the 19th and 20th Cent. 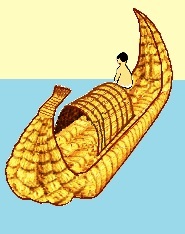 Simple huts woven from papyrus provided housing for many people in archaic times were most often mounted directly on papyrus boats, floats and skiffs. After 3200 BC mud brick buildings were common in agricultural settlements and in the special towns set up to shelter thousands of workers in areas where monumental projects were under construction. But even with mud brick there were problems, especially in low-lying areas where houses were liable to dissolve or be washed away during the inundation. Residents in those areas had to re-build on top of old houses. In the process they built up a mound, and eventually provided a more secure environment, but it must have been discouraging each year to start from scratch, unlike the old days in the Water World when you and your family floated high and dry in your papyrus craft as the life-giving water spread throughout the land, and rocked you to sleep every night.